This cute personalized sign is features incised lettering on pine. You can use a first or last name - up to 10 letters. The sign measures approximately 12" across by 7.5" deep and hangs from a brass chain attached to the top. These are just a few of our pre-designed signs. If you don't see something that suits, let Tom know what you are looking for. If he doesn't have any pre-designed signs to meet your needs, he will be happy to develop a custom sign just for you! 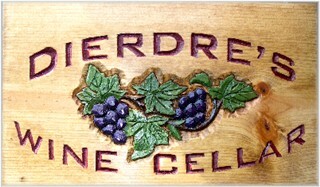 See our Commissioning a Hand Carved Wood Sign page for design details.